Charming & spacious 3 bedroom/ 2 bath beach home, sandiest part of Soliman Bay. A newly remodeled rustic Mayan style palapa home, on the most sought after beach in the Mayan Riviera, PUNTA SOLIMAN, just 7 miles north of Tulum pyramids....is your ticket to paradise. The turquoise waters and white sands are just steps from your front door, and the bay is teeming with a lively array of tropical fish, included- but not limited to: angel fish in all shapes and colors, paradise fish, turtles (if you are lucky), parrot fish...lobster, conch and mantarays. You can snorkel out to the reef which is nearby and serves as a barrier, so that the waters are always tranquil and user friendly, perfect for kids and seniors alike. the town of Tulum not to mention 10 minutes from famous ceynotes, (underground rivers), where people come from all over the world just to snorkel or dive. It is a low density neighborhood, with all of its natural beauty still preserved...making it an ideal location for birdwatching (herons, storks, spoonbills, parrots- during the winter season... please drive slowly & do not disturb them) stargazing, clothing optional sunbathing, hiking (to nearby cenotes...which are fresh water natural swimming pools), kayaking and just plain kicking back with an insanely cold CERVEZA beer. Did we mention the fabulous snorkeling again? On any given day you will see octopus, flying eagle rays, turtles, and very pretty tropical fish. Only to look at though. Absolutely no fishing in this bay. It is protected. Our home has 2 queen beds, and 1 full bed. we can also throw in a twin. The kitchen and living room are a gorgeous open space with sea breezes blowing through...all day and night. In the evening you can actually see stars and constellations from 2 private rooftop decks.. in your bedroom. There are 2 restaurants conveniently located at each end of our bay, if u don't feel like cooking in your well equipped kitchen. There is a little table and chairs on the beach (not fancy), if u want to enjoy a snack outside, and we provide comfy beach chairs and hammocks.Wifi internet access provided. Our bay also has 24 hour security. Just tell us what you need, and we will try and provide it. We want you to have the most perfect vacation possible. We can set up massages, a cook, or even yoga lessons. we are waiting for you., with cold cerveza in hand. 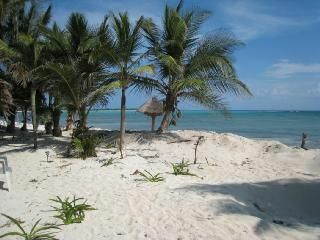 It is a simple inexpensive, beach house, with great Mayan character as many places are on Tulum beach. We try to make our home affordable to all, and many families have great vacations with us! It is a self service home., we do provide you with some essentials, but you are responsible for refills when you run out. Came here for a vacation with mom, fell in love...on the beach, the rest is history! It CAN happen to you, especially in such a romantic setting. It was one of the original properties on our bay, built by the Mayans. View more about Lily R.
Free standing home, 10 steps to the water. There are no other units on property, so you will not be sharing beach with strangers! Huge eat-in kitchen, with formal dining area. Nice rooftop deck ,off of 2cd bedroom. Your own house on a tropical beach! What a fun beach adventure! The palapa home is a bit rustic, but has everything you need for a true BEACH vacation. (Although, we wished it had wifi!) It is not a luxury home. More so, it feels like spending a week in a hut on Gilligan's Island. The home is surrounded by lush vegetation, complete with bugs, lizards & hermit crabs. With a private driveway up the hill, the house is set back a nice quiet distance from the road. Walk out the back door and directly onto your own little slice of beach! Palm trees are huge and fabulous. I enjoyed sitting on the beach at night and listening to the breeze rustle through the palms above. We drove to Coba & rode bikes through the jungle, to the public beach of Akumal to swim with many huge sea turtles, and across the street to LabnaHa to swim in the underground cenote. All were fabulous. We did most of our own cooking after shopping at Chedraui, but feasted a couple of nights after buying amazing fish tacos off the main street in Tulum, and a complete Mexican chicken dinner from a street vendor in a village on the way back from Coba. (Remember to convert dollars to pesos before you arrive.) NOT impressed with Oscar y Lalo's. Save your strength to lug the heavy kayaks down to the water and back, as you will definitely want to make many trips out to the buoys to snorkel around the coral where you will see rays, sea turtles, urchins, barracuda, zillions of species of fish, and maybe even a lion fish! The kayaks & paddles are a bit old, but still do the job! The home itself is filled with interesting quirks... but was perfect for us. After 9 years of all inclusives, we crave private little homes like this. The hot water did not work in the downstairs bathroom, but Dan is hoping to fix this. We ran out of water once, but Dan worked well into the night to make sure the tank got filled. Mother Nature had dumped seaweed all along the Mexican coastline. Other beaches were being raked & cleaned up daily. Our beach was left natural. Oddly enough... most of the seaweed then drifted to the rental next door! How nice. We think Mother Nature likes Dan and Vera for the way they respect nature. You will enjoy daily sunrises over the bay if you get up early. The orange glow spills into an upstairs bedroom each morning. We walked north on the beach to the point to explore tide pools and watch the sunset behind the beach houses. We hope to return to Las Brisas for another week of fun in the Soliman Bay sun! We hope Nature -and our guests also love us. Water is real hot downstairs and beer real cold ! Privacy and Beachfront....an ideal combination! This home on Soliman Bay is a wonderful place to plant yourself while you enjoy all that Tulum offers. The beach and bay are ideal for children and the privacy afforded is an incredible treat, since your back door steps right onto the beach. Kayaks and equipment are in good shape and we took several rides around the bay in them. The home is as described, with the kitchen roomy enough to make meals while also visiting with others sitting in the dining area or living area. When the breezes are coming off the water, you can feel the coolness in all rooms. The downstairs bedroom has great air conditioning for the rare days when the breeze is light. There are plenty of places in the home to get some quiet time with a book or just your thoughts. One can truly get 'off the grid' with this rental. It's 38 steps, across a dazzling, white sand beach, from the house to the water's edge. We spent most of our days lounging under the palapa, reading and admiring turquoise blue water. We took out the kayaks daily to the reef and snorkelled. We were lucky enough to see turtles a few times. They seemed to hang around the turtle grass just to the left of the house and out on the reef. There are turtle grass beds in the water but the area just to the right of the house is wide and sandy. The house was spacious and because of the way it was designed, there is a constant flow of air through the rooms which keeps out bugs. This property is self-catering and there are no housekeepers on-site. Unlike many of the properties on the bay, Las Brisas is a single dwelling which means you never have to share the beach area in front of the house. We have two energetic kids, so it was nice to know they could make noise without disturbing other guests. Dan and Vera were great hosts. We met them at check-in and they took the time to answer all our questions. I did contact them during the week to ask if we could borrow a cooler for a day trip into the Biosphere and Dan dropped one off promptly. Dan showed us where the best part of the reef was, and where the buoy was located and Vera told us the route to take to walk to Casa Cenote at Tankah Bay. (Go before 10 am and you might be lucky to have the place to yourself). The kitchen was well equipped and there were a few staples already there. We stopped on the way down at PDC to pick up groceries and stocked up in Tulum when we needed stuff. Soliman Bay is blissfully quiet. We ate one afternoon at Chamicos at the south end of the bay and the kids would walk north up the beach to Tienda Bob for ice cream in the afternoon. The location is great for dining in Tulum. Just remember to exit kilometre 241 on the 307. We love families with teenagers ! We had the privilege of spending both Christmas and New Years at Las Brisas this year and what a fantastic escape from winter in Idaho! The house was awesome and has some very unique features-- Dan & Vera were most helpful with every little detail of our stay which was a plus as well. Soliman Bay is a very secluded location, but we totally enjoyed just kicking back with the family! There are only a couple of restaurants within close proximity, so we shopped in Tulum for groceries and did a lot of cooking-in. Additionally, Dan & Vera recommended that we have one of the locals, Estephan, cook for us and that was a real treat. The snorkeling was outstanding right outside of our front door and having access to multiple sea kayaks really enhanced the experience. We went to the Dos Ojos Cenotes one day, and for a small entrance fee (I think about fifty pesos) we found that to be an unreal adventure. Originally we were a little bit iffy about renting a car, but have no fear because it turned out to be no problem at all-- easy driving for sure, and extremely convenient, thus I would suggest getting a car when staying at this location. I highly recommend this house for anyone desiring a laid back, easy going vacation without all the hustle and bustle of the mega resort areas - We can't wait to return! Thank you Dan & Vera. And we had the privilege of having a beautiful & inteligent Idaho family stay in our humble beach home. Very spacious house on quiet, lovely beach-best setting on the bay. Coral reef a short distance off shore easily accessed by owner provided kayaks. Bring your snorkels and masks. If you enjoy birdwatching you will love the pelicans who favor the fishing directly in front of the house. We could have watched them for hours while swinging in the hammocks or sunning on the beach. Plenty of room for 6 people. 3 double beds and a twin. Large kitchen, dining and living areas. Second floor sunny porch protected from the sea breezes for cooler days. 2 upstairs bedrooms with sunrise views. Dan and Vera are attentive hosts who work hard to make your stay perfect. Very knowledgeable about the area with lots of ideas for your recreation. House clean and relatively well-appointed, although we would have used a few more kitchen utensils, pots if they had been available. Downstairs shower is a bit of a trickle, but the upstairs one works fine. Plenty of room for private space for yoga, napping undisturbed or reading as well as common space for partying with family or friends. 10 min drive from Tulum pueblo and ruins. Many good restaurants. 2 hrs from Chichen Itza, (we did not make the trip as we were looking for rest and relaxation not ruins), but there are plenty of ruins much closer if you wish. Xel-ha a wonderful natural water park, several natural cenotes (underwater caves for snorkeling) within 20 min drive, in addition to the more touristy theme parks of Xcaret and Xplor. Vera , Dan & pelicans say hi & thank you ! Las Brisas was simple and very spacious. Plenty of room in this rambling beach house to spread out and relax. The beach and bay were beautiful and quiet. Great snorkeling and kayaking. Close to great restaurants and major cultural attractions, but secluded and peaceful. I would definitely come again. Sunbathing, kicking back with a 'cerveza', snorkeling, going for long walks on the beach, stargazing, and taking long naps are some of our favorite activities. Xel-ha, a large natural park is 6 minutes away where you can snorkel in a pristine lagoon with turtles & angelfish, among other activities. Tulum is a 10 minute drive, where you can explore the gorgeous Mayan Ruins, and Coba another 30 minutes away.. has some of the most spectacular jungle ruins in the area. Tulum has a selection of first class restaurants, and mom and pop taco stands , both of which are quite delicious. (see our in-house list of favorites). Tulum beach is worth spending a day on..it is a wide as a football field.. as long as the eye can see. Ask about our tours to Sian Kaan, a human heritage site.Take a boat trip down winding mangrove rivers. Want to dive, we can set you up. We have an extensive list of suggestions at your disposal. Massage and yoga lessons available upon request.